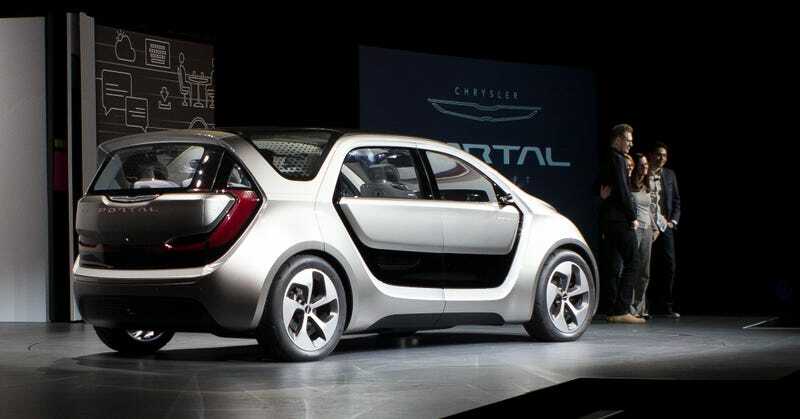 This morning, when Chrysler unveiled the design for its futurist box-shaped concept car called the Portal, the vehicle stood out for the simple fact that, coming across as a mobile room, it really makes sense for how an autonomous car should be designed. When the automaker took the stage at CES today, it came across more as an attempt to pander to millennial stereotypes than any sort of transportation revolution. The claimed range for the Portal with its electric drivetrain is up to 250 miles, which is also nice. But from the outset of the presentation Tuesday, it became clear that FCA is hoping to bank on pandering to millennials, as indicated from a press release issued earlier. The presentation started with a clip of three young kids dressed in lab coats, talking shop about the Portal. The kids let us know that it was “designed by millennials for millennials.” And man, did they work to drive that point home. Then, FCA engineer Ashley Edgar took the stage. She explained that indeed, it’s true, millennials will comprise one-third of the driving population within the next decade. “So we need to make that third space a vital and pleasant part of their lifestyle,” she said. Cindy Juette, interior designer at FCA, followed, and the takeaway from her remarks seemed to be that this car is for millennials, and they’ll realize this thanks to lovey-dovey platitudes—and that’s what millennials love, platitudes about what they like to do. “We envision a modern architectural space, a gallery drenched in open light,” Juette said of the Portal, which is ostensibly still a car. And Emilio Feliciano, user experience designer at FCA, peppered his dry remarks with ill-advised jokes about the coveted demographic, as if we’re hard-wired not to do anything else but tweet on the fly. FCA apparently set out to interview millennials in a dozen cities across the world to gauge what they’re looking for in a car. “We learned that while millennials like buying things devices as much as everyone else experiences are much more meaningful, and that’s why we try to capture these experiences,” Feliciano explained, painfully. And when Feliciano mentioned the audio system that’ll apparently allow zones of the car to listen to different music, he dropped a joke that even he seemed pained by. The customizable seating, concept and color scheme makes for an interesting sell, too—part of what was described as the driver’s “third space.” But what is it that makes FCA all of this is something only millennials will dig? Sure, there’s obvious concerns that millennials of the future simply will reject driving en masse, but the FCA presentation came with an air of desperation that seemed awfully contrived. Why not just play up the car itself? Why does it have to be a rolling focus group? There’s much here that’s to be welcomed—hell, pointing out that the audio system will amplify the siren of an ambulance as it approaches was far more interesting than trying to sell the world that this is the Car of the Future For Millennials. And equipping it to be ready for autonomous technology is notable, too. But taking Edgar’s points at her word, it’s almost as if FCA believes every millennial henceforth will only be interested in vehicles with an interior that can be designed specifically for them, as long as it goes from A to B and allows them to obsessively use social media, because of course, every millennial spends every waking moment on Twitter and Instagram. The Portal’s conceptually interesting, but it really is difficult to imagine after the presentation Tuesday how well any of this would perform on the market if put into production. “For millennials,” just wouldn’t seem to cut it.